I love coming home to a clean, fresh smelling home, but I sometimes find that goal a difficult one to achieve. 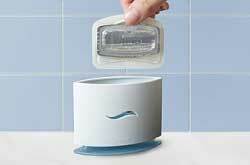 Scents and odors seem to creep in when you least expect them and most air freshening options just don't last very long. I've always been a fan of Febreze and that wonderfully clean smell they're known for. 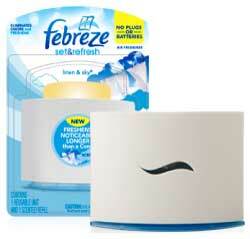 Recently, I learned of a new way to keep your home Febreze fresh. It’s Febreze Set & Refresh. This new air freshener eliminates odors while releasing a fresh scent and doesn't require electrical plugs or batteries either. Keep reading to learn more! Febreze Set & Refresh claims to keep your home's smaller spaces smelling fresh for much longer than conventional cone-style air fresheners. It doesn't require the use of batteries or electricity either for it slowly releases scented oils into the air for 30 days. In much the same way that the cone air fresheners work, you can open the Febreze Set & Refresh all the way to get a full freshness experience, or close the device for use in smaller spaces. There are several wonderful scents to choose from and I was given the Linen & Sky variety to try. I absolutely LOVED how fresh and clean this scent was. I immediately put the Febreze Set & Refresh to work in our downstairs bathroom to combat the odors that typically linger about. It was so nice to enter this bathroom and receive a breath of fresh air instead of the sour air that can sometimes greet you in a bathroom. This room is very small and so I kept the Febreze Set & Refresh closed and loved how it still worked great, gently releasing the scented oil from the cartridge. I liked the clean lines of the Febreze Set & Refresh air freshening unit, for it looked much better than the air freshening cones, though I wish that they came in different colors, such as tan or black, to match a wider range of decor. Perhaps in the future, Febreze will consider expanding the color selection of the main unit. 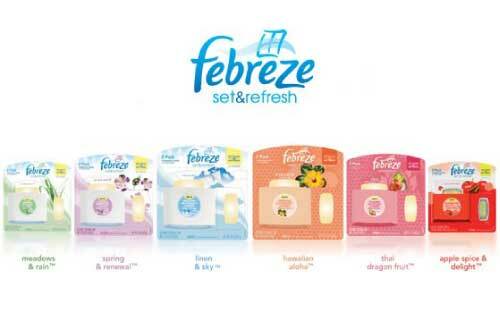 If you are need of a little freshness throughout your home, then by all means, eliminate those odors with the fresh smell of Febreze Set & Refresh. Your nose will definitely thank you for it! Disclosure: I wrote this review while participating in a blog tour by Mom Central Consulting on behalf of Febreze and received a Set & Refresh unit plus refills to facilitate my review and a promotional item to thank me for taking the time to participate. Hi there. thanks for sharing this. That febreze does have a good smell.